Every 42 seconds, a car is stolen in the United States. I know sometimes people wish their car would be stolen, particularly if it’s costing too much to repair, but did you know that the odds were 1 in 186 of your wish actually becoming a reality? The car insurance industry, through CarInsurance.org, came up with those and other “fun” facts about car theft in the U.S.
Did you know that car theft results in an annual property loss of $5.2 billion? Yeah, it’s boat load of money and we all pay for it with increased car insurance premiums. Or how about the fact that one half of stolen cars are simply left unlocked, inviting a would be thief inside. Is it that hard to lock your car or are people too distracted to bother? In the past, I’ve posted the annual list of 10 most stolen vehicles, and as usual, it’s an informative read. 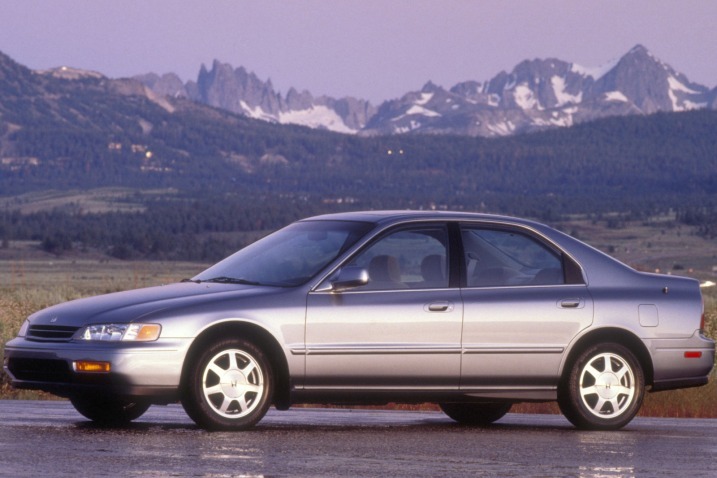 The 1994 Honda Accord takes top honors again in the insurance industry’s list of Top 10 Stolen Cars. It’s a testament to the popularity and longevity of the Accord. That may be good or bad, depending on your view. I asked if the website had statistics specifically for Southern California, but they didn’t. Still, there are so many of the cars on the list that are extremely popular and common in the Greater Los Angeles area that I’m sure the Top 10 So Cal list wouldn’t look too different from the national list. I frequently read the Crime Blotter for the West Hollywood area and many of the behaviors on the infographic sound very familiar. For example, many cars get broken into because the driver leaves valuable stuff like a purse, wallet, iPhone or portable GPS device in full view and often the reports will say that the cars were unlocked! It seems so obvious to hide stuff or take it with you and lock your car, but people are busy or distracted and they forget these sensible precautions. I also found something on the stupid list that I have done many times without a second thought — and I see all the time at the West Hollywood 90069 Post Office. I leave my car running while I drop off a letter or check the mailbox. I’m only out of the car for a few seconds and the car is always in sight, but I probably shouldn’t do it. One more thing. Poor Fresno. As if it wasn’t already saddled with the reputation as “the armpit of California” or loathed as the long-time home of the regional IRS Service Center, it is also the national car theft capital. Condolences, my friend. I’ll try to think of you as just one possible stop on the way to Yosemite and everyone loves Yosemite, right? If you’ve ever worried about getting your car stolen, you’re certainly not alone. In the US, a car gets stolen about once every 42 seconds, and no matter how comprehensive your auto insurance plan is, a stolen car can be a huge headache. Chances are you take all the usual precautions to keep your car from being driven away, but you’d be surprised how many people aren’t quite as careful with their vehicles. From leaving doors unlocked to keys in the ignition, plenty of forgetful behaviors can contribute to making car theft that much easier. The following infographic offers a twist on the subject: You know how not to get your car stolen, but have you ever considered all the different behaviors that can make getting your car stolen a reality? It might sound ridiculous to you, but in fact, plenty of the habits and forgetful behaviors practiced by car owners everywhere start to make it seem like many cars that get stolen were just asking for it. There are surprising contributors to car theft as well, from what state you live in to what kind of car you’re driving. Some factors that make your car liable to be stolen are obvious, and others may be more unexpected. If you’ve ever wondered how cars get stolen, read on! If you haven’t figure it out, CarInsurance.org is an industry-sponsored educational website acting as a insurance quote and referral service. In other words, a sales tool. I don’t endorse the group and they aren’t paying me anything to post this information. I just thought it was a great graphic with interesting, funny and disturbing facts. When you visit your Acura dealer (if you can find one) to test the new Acura ILX, just don’t say any word that starts with an I and ends with an A. They are very sensitive about past history. 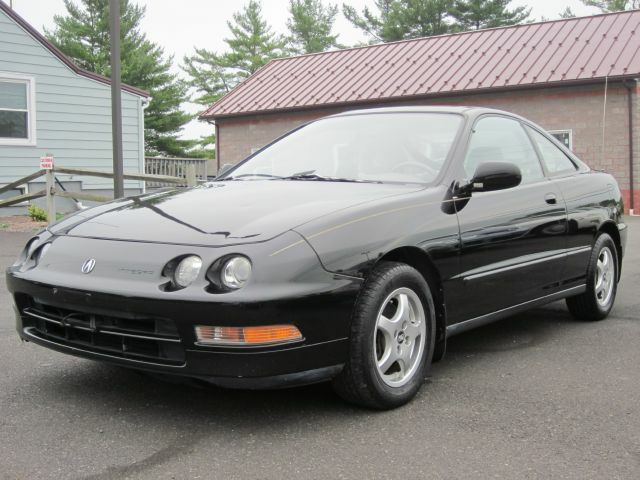 An example of the most-stolen 1994 Acura Integra. Love the headlights! It’s been six long years since Acura offered an entry level vehicle based on the Honda Civic. The Acura Integra (damn, there’s that I-word) and its successor, the RSX, achieved almost mythical status as an entry level sports luxury coupe (and sedan) with exemplary front-drive handling characteristics. In fact, in the latest Insurance Industry statistics, the 1994 Acura Integra holds the esteemed number eight position on the most stolen list. It was that popular! Enthusiasts are still wounded over the unceremonious demise of the Integra/RSX’s. The Acura brand found itself in crisis after a widely-panned styling gamble and mixed messages about its place in the crowded luxury car field. Customers stayed away in droves and Acura fell off many shopping lists. After the devastating 2011 Tōhoku earthquake and tsunami and the equally crushing criticism of the ninth generation Civic, Honda was a company in crisis, battered into a corner, bruised and bleeding. The 2012 Civic, introduced shortly after the earthquake, is an all-important model for Honda. It was widely-panned for its lack of inspirational design and warmed-over technology. The styling of the Acura ZDX never caught on and its price (base $47,015, loaded with the Technology and Advanced Package, $57,565) scared off many buyers. 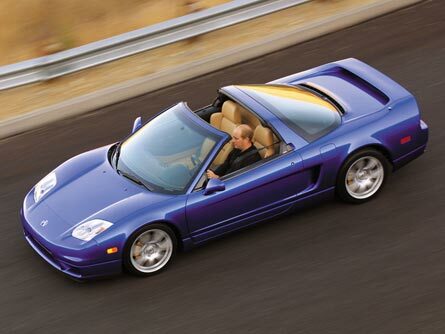 The NSX was Acura’s halo car for 15 years. This beautiful 2005 model still looked fresh; but Acura simply dropped the ball on its successor. We won’t see a new NSX for another two or three years. Acura, Honda’s luxury division, was also in trouble. Its flagship RL sedan, introduced in 2005 with a mild refresh in 2009, flopped from day one. The odd BMW X6-like and expensive ZDX SUV remains unknown to most consumers. The beloved and the sublime NSX sports car wore Acura’s halo for its 15 year run; but Acura never planned for its replacement and it disappeared from showrooms in 2005. In short, Acura, the first Japanese luxury brand introduced in the United States, has been adrift in brand wilderness for a while now. Before the new ILX, Acura relied on two models to keep the ship afloat. The TL is a dressed-up Honda Accord stuffed with extra luxury touches and the option of a trick “super-handling” all-wheel drive system. 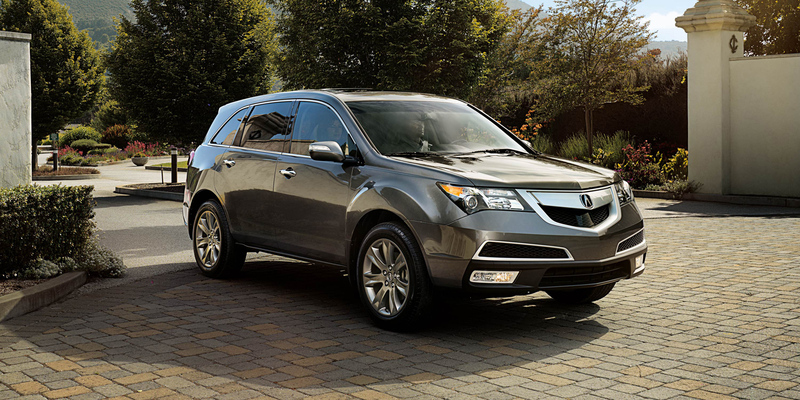 The MDX, a traditional luxury SUV also bristling with technology and luxury features, is based on the Honda Pilot and has been a solid seller since its introduction. Starting at just $25,900, the ILX, the smallest Acura, is an excellent upgrade to its Honda Civic cousin. The base ILX 5-Speed Automatic is outfitted with Honda’s 2.0L i-VTEC four making 150 hp and 140 lb-ft of torque – an upgrade over the Civic’s 1.8L mill. Honda’s ubiquitous 5-speed automatic transmission with Sequential SportsShift is the only transmission. I doubt it will set the performance world on fire; but it will likely be the volume leader. It was also the only model that wasn’t available to drive at the Acura ILX All Access Ride & Drive Event I attended in a parking lot across from the Staples Center. 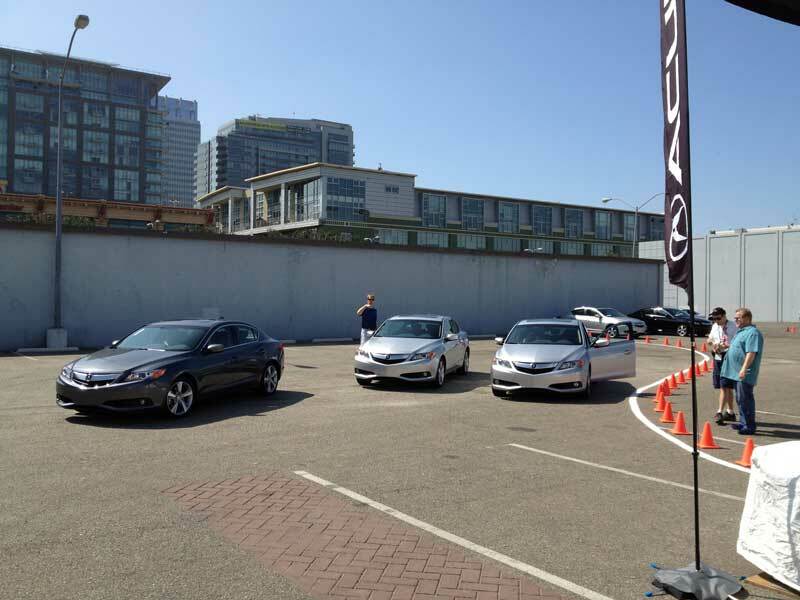 The Acura ILX All Access Ride & Drive Event was held in a parking lot across from Staples Center. In this picture, both Hybrid and 6MT models await drivers for the cross-town drive portion of the event. The Acura magic wand also means that the cheap, nasty, hard plastic interior panels and surfaces that offended drivers of the Civic have been banished in favor of upgraded softer and textured materials that feel and look upscale. In addition, a heavy dollop of soundproofing isolates the cabin from outside road noise. 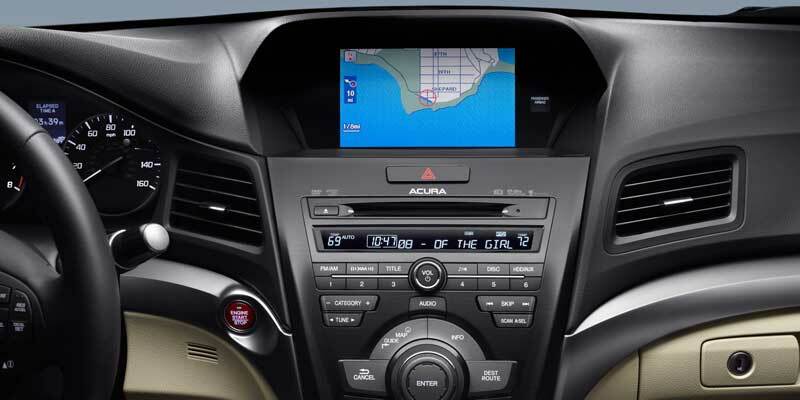 The interior of the 2013 Acura ILX is a much more inviting place than its Honda Civic cousin. Hard plastic surfaces have been banished in favor of soft-touch and textured materials. 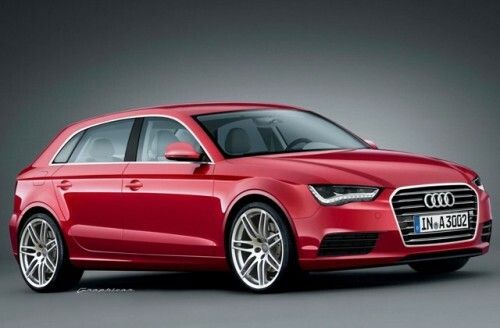 The 2012 Audi A3 Sportsback doesn’t come to mind when I think about the 2013 Acura ILX. Sorry, Acura. Acura would like us to believe that the sole competitor to the new ILX is the Audi A3 Sportsback. Really? The A3 is more expensive and its excellent German engineering coupled with superb, class-leading interior craftsmanship don’t spring to my mind when I look at the ILX – not to mention that the A3 is a wagon and the ILX is only available as a sedan. 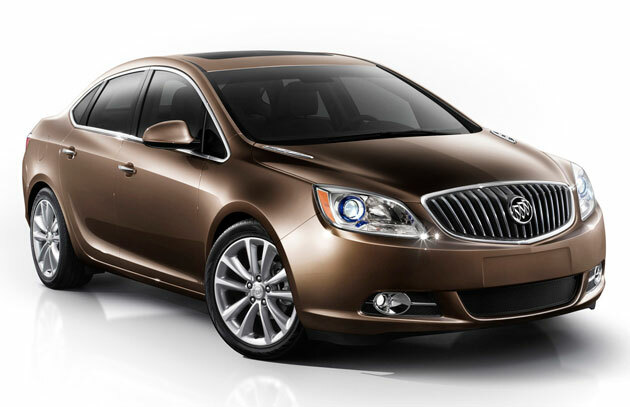 The 2012 Buick Verano is a nice small, upscale near-luxury sedan – exactly what I equate with the 2013 Acura ILX. To me, the closest competition in price and luxury features would be the new Buick Verano. But Acura doesn’t want its customers to associate Buick with Acura. Buick is an “old man’s” car, right? Well, yes, sort of, but Buick is desperately trying to change that image and Acura is desperately avoiding any suggestion that it’s anything other than a sporty youth-oriented brand. My first drive was the ILX 6MT featuring the entertaining drivetrain lifted directly out of the Civic Si. It features a 2.4L naturally-aspirated four-cylinder engine making 201 hp and 170 lb-ft of torque married to Honda’s exemplary close-ratio 6-speed manual transmission. 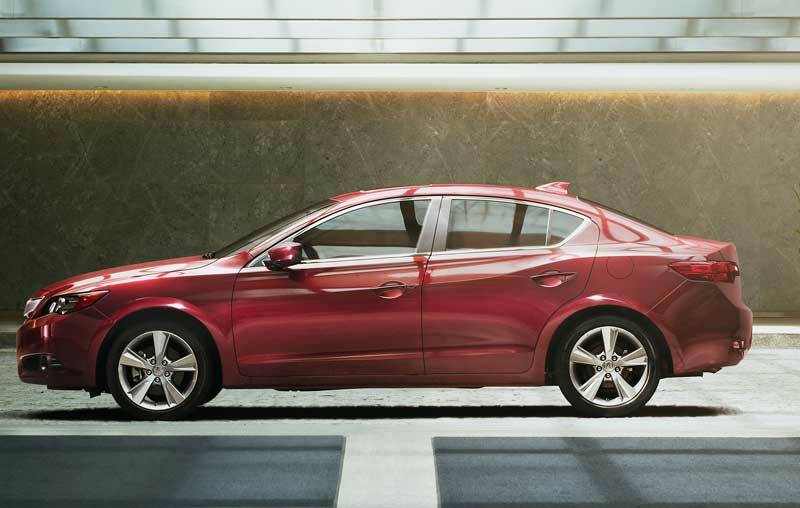 The 2013 Acura ILX MT6. It uses the excellent powertrain from the 2012 Honda Civic Si. The sweet 2.4L four cylinder engine is only offered with the 6-speed manual transmission. This will severely limit sales as most people want an automatic. It will, however, satisfy some enthusiasts. 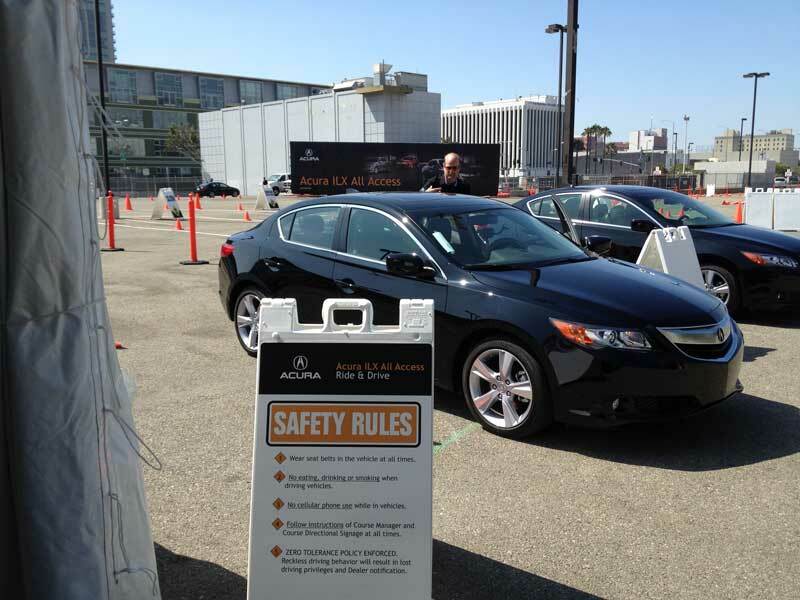 We had our safety rules for the closed course portion of the Acura ILX All Access Event. This was the starting point, from inside a tent. Honda estimates that the 6MT model with standard Premium Package ($29,200) will account for only 5% of ILX sales. If Acura dropped the 5-speed Sequential SportsShift automatic from the TSX (which uses the same 2.4L engine) into the sporty ILX it may get more sales from drivers wanting a bit more than 150 ponies under the hood. I’m not holding my breath. I had forgotten just how excellent the Civic Si was and I was happily reminded with the ILX 6MT. Honda’s close-ratio row-it-yourself 6-speed gearbox is polished perfection. Our ten minute on-road course took us on the surface streets around Staples Center. The clutch was so creamy, linear and easy that you could drive it on a daily basis in LA with little distress to your clutch foot. The car never bucked on gear uptakes and I didn’t stall it once. 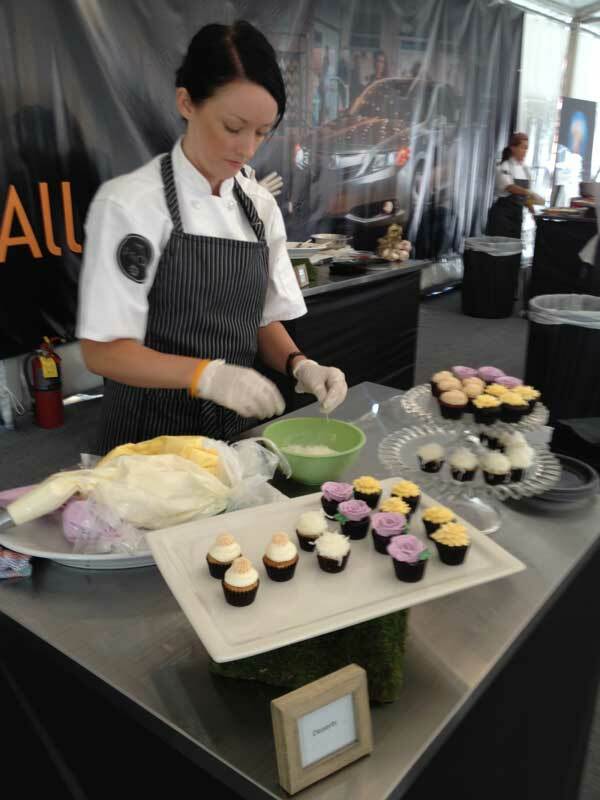 The food in the lounge/food tent was pretty good. Overall it was a nice setup. The slalom course included lane change, an NVH (noise, vibration and harshness) test and potholes. The little steering wheel felt just right in my hands and the electrically-assisted rack-and-pinion power steering provided sufficient feedback and on-center accuracy. It cuts a tight turning circle too. The happy revs, variable-ratio EPS and well-sprung and dampened 4-wheel independent suspension chassis meshed effortlessly for lighthearted entertainment if not blistering speed. 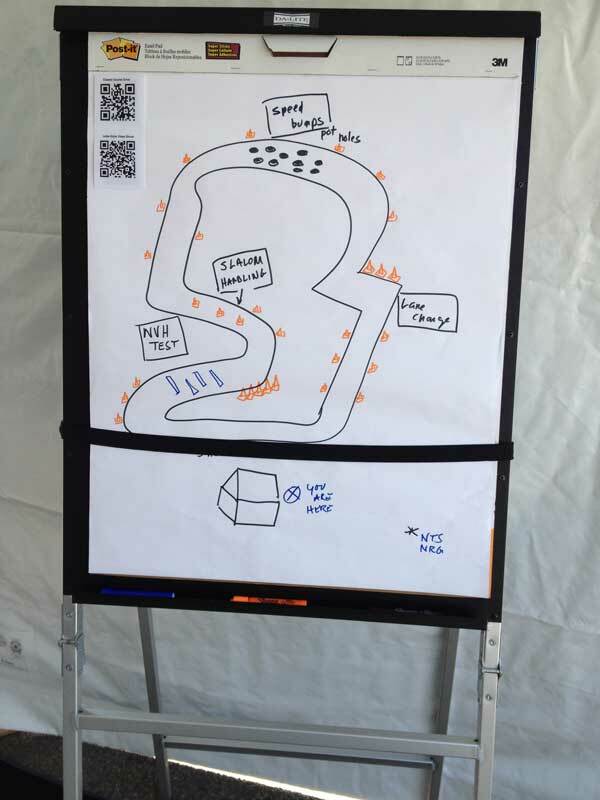 It even performed well in our off-street mini-slalom/NVH course. My second drive was the ILX Hybrid that comes standard with the Premium Package. If you believe the EPA estimates, the Hybrid should get around 38 mpg, no matter where you drive. Assuming normal driving, you’re likely to get closer to 35 mpg. 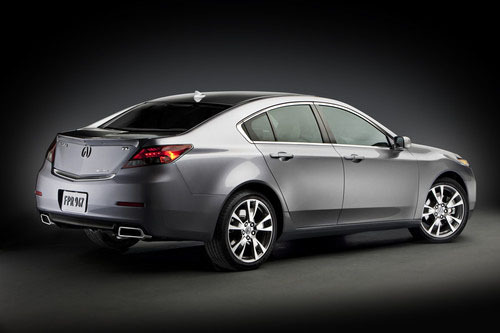 The extra weight on the ILX accounts for the reduction in fuel economy from the Civic Hybrid which is rated at 44 mpg. The Hybrid’s drivetrain is identical to the drivetrain in the Civic Hybrid: A 1.5L four-cylinder 110 hp gas engine coupled with Honda’s Eco Assist system which includes a 23 hp permanent magnet electric motor sandwiched between the engine and the continuously-variable transmission. The new-generation Civic/ILX Hybrids use a 20 Kw lithium-ion battery pack. As long as the green ball in the middle of the dash display stays green and grows, the car is happy. Any sudden moves on the accelerator are greeted with disapproval from both the shrinking, yellowing ball display and the whining CVT. It’s not going to win any races, but the people who buy this car don’t care. 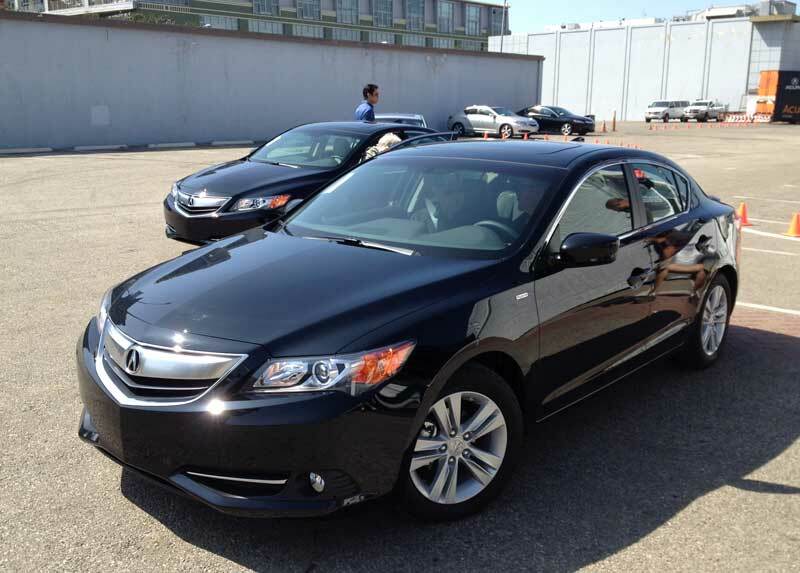 The ILX Hybrid with the Technology Package and shipping is a whopping $35,295. The Civic Hybrid with all the goodies is about $6,500 cheaper. I’m not sure Hybrid buyers will drop the extra dough for the Acura upgrade and extra features. The ILX Premium Package is a must-have and it’s standard on all but the base ILX. It includes perforated, heated, 8-way power leather-trimmed sports seats, a multi-view rear camera and dual-zone automatic climate control – goodies you’ll never find on Honda Civic. At 6’1”, I was able to find a comfortable seating position in the ILX – something that never happened with the Civic. The ILX 6MT interior, with the Premium Package, shows the nice sports, power perforated leather seats. Cup holders are large and should suit American tastes. The Technology Package is the top trim level for all ILX and encompasses all the tech-geek features we have come to expect from Acura: Acura’s excellent satellite-linked navigation with Real-Time Traffic and Weather; An Acura/ELS sound system with more speakers (10 not 7), more watts (415 not 360) and a 15 GB media storage hard drive good for storing up to 3,500 songs. Acura’s voice recognition system is better than others. The Technology Package trim level adds a terrific sound system, navigation, text-to-voice and many other goodies. Notice the red pushbutton start in the lower left corner. It’s standard on every ILX. All this great technology and yet HomeLink, the decades-old nifty feature that allows you to control gates and garage doors with a built-in interface, is nowhere to be found. Not even as a dealer accessory. I just shake my head. 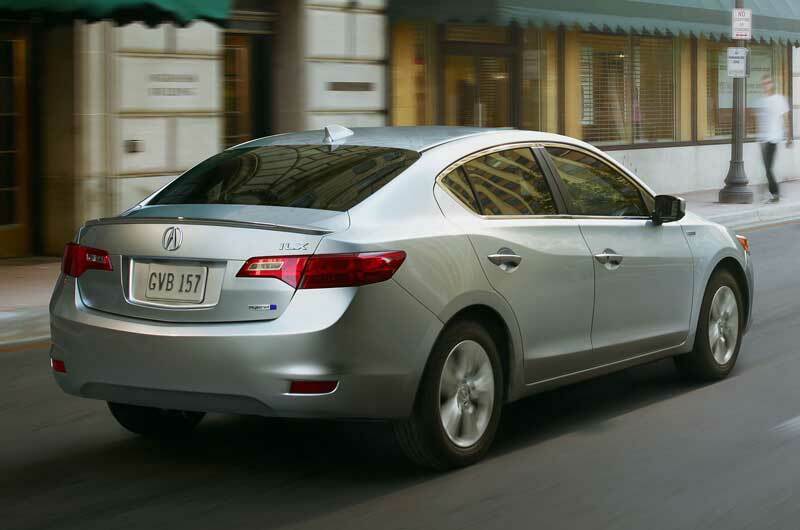 A keyless entry and pushbutton ignition system is standard across the ILX range. The key fob is small and slim – something I wish every manufacturer would adopt. If you have a keyless system, why does the fob have to be big? A big fob may work well when lost inside a woman’s purse, but doesn’t do wonders in pants pockets. The brushed chrome “beak” of the new ILX gives it a nice edge and I think the new sheet metal is handsome. If only the Honda Civic looked this good! 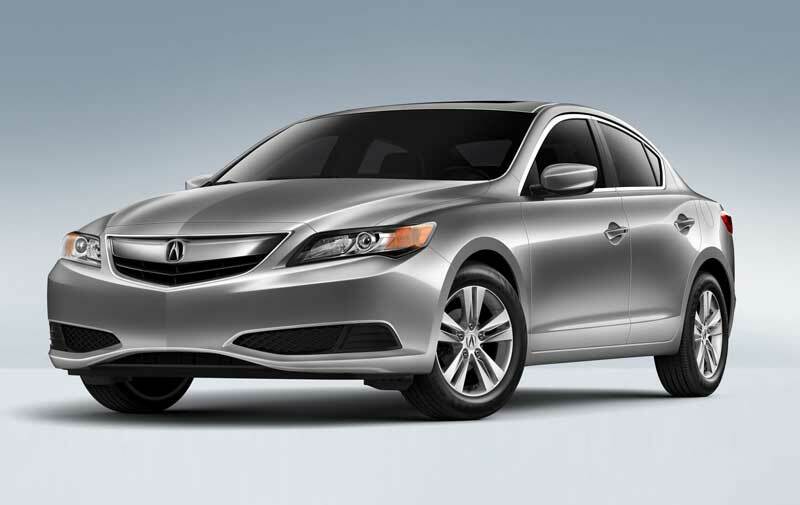 The ILX carries the latest softened version of Acura’s bold front beak/blade look. 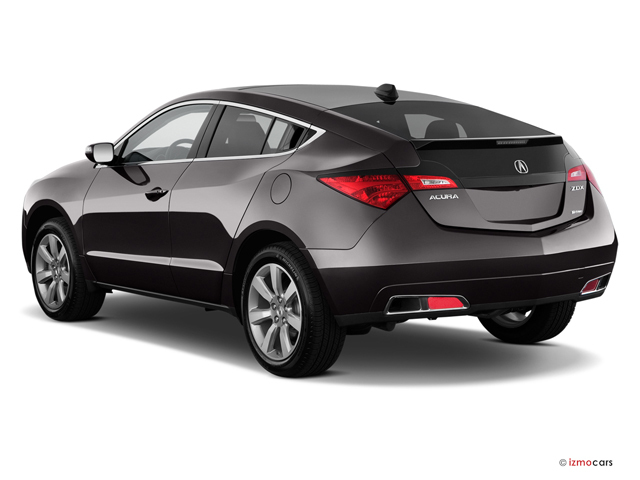 I rather like the handsome, if conservative looks and think it’s a good entry-level product for Acura. If you yearned for a Honda Civic with better styling, respectable interior plastics, a longer warranty and a host of luxury features, look no further than the ILX. If you were looking for another Integra, check out the ILX 6MT. It’s not the “I-word” and it’s not a coupe, but it’s sure an impressive upgrade to the Civic Si sedan.